Maritime is one of the main types of materials handling industries in which forklifts are used, which includes shipyards, marine terminals, and longshoring. Below we take a deeper look into each of these industry segments to understand the requirements and regulations of forklift operators. For all three maritime segments, the requirements for operator training of powered industrial trucks is the same, which is covered under regulation 1910.178(I). The operator must be deemed competent by the employer through training or experience to understand signs and instructions. The marine terminals sector falls under Part 1917 and applies to all workers employed in this industry that may be involved in the loading, unloading, or handling of cargo, gear, or ship’s stores in the terminal, land carrier, holding area, or other area of a terminal. The marine terminals regulation covers all employees who work in a shore-based material handling facility. It does not cover facilities containing flammable, non-flammable, and combustible liquids and gases, or automated coal handling facilities. Longshoring falls under Part 1918 and applies to longshoring operations related to work aboard vessels. It involves the loading, unloading, moving, or handling of cargo, ship’s maintenance and safety materials, gear, and other materials in, on, or out of a vessel. Part 1915 covers shipyard work which applies to ship repairing, shipbuilding, and shipbreaking and related employments. Competent persons designated by the employer may perform one or more of the following activities: repair work on small craft in boat yards where only combustible gas indicator tests are required for fuel tank leaks, building of wooden vessels where the knowledge of precautions to take when using flammable paints is known, and the breaking of vessels where there is no fuel oil or other flammable hazard. 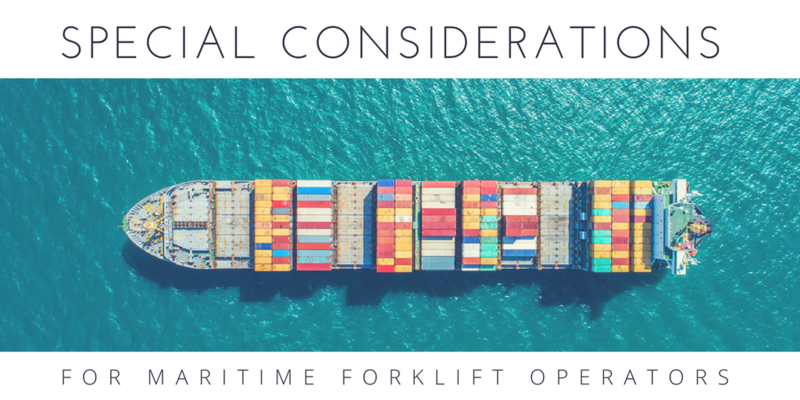 In addition to Class 1, 2, 4 and 5 forklifts, container top handlers, container reach stackers, straddle carriers, hustlers, toploaders, semi-tractor vehicles, sidehandlers, and yard tractors are also used in the maritime industry under OSHA regulation. Marine terminals, shipyard, and longshoring work each come with their own safety protocols and hazards. When working on or near large vessels, the work of powered industrial operators may include railroad facilities, maneuvering ramps and grades, driving aboard vessels, stowing cargo, handling hazardous cargo, and dealing with carbon monoxide. Completing a comprehensive forklift certification course that is OSHA-compliant will ensure workers are prepared for all of these activities, and will be able to recognize and avoid hazards and unsafe practices. These activities differ greatly from on-shore work and construction work, and it’s important to know the proper operational practices for working in marine terminals, and for shipyard and long shoring work. Create an account with ForkliftCertification.com today and receive your OSHA-compliant forklift operator certificate in about one hour on any device with an internet connection.